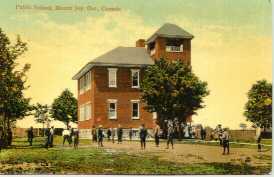 The Markham Museum and Historic Village is located on the original site of the Mount Joy Public School. The Town of Markham purchased the Edwardian style school building, built in 1907, in 1969 to house the Markham Museum. The surrounding 25 acre Historic Village showcases more than 20 historic buildings, dating from 1820 to 1910. Visitors can tour Markham�s oldest church, a sawmill, general store, early blacksmith�s shop and homes from different periods. The Mount Joy Schoolhouse is located on the east half of Lot 16, Concession 7 on property which was originally granted to Alexander Hunter in 1845. 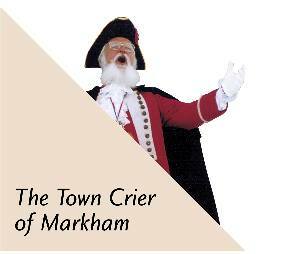 Markham Township was divided into 23 school section with one schoolhouse for each section. Designated as school section 16, the present school building was constructed in 1907. It was constructed to replace an earlier school, which was located south of the newly purchased lot, at the north end of Daniel Strickler�s original 50 acre parcel. The Mount Joy schoolhouse exists on its original site, and appears to have been constructed to support the increased population in the Mount Joy area. This large elementary schoolhouse was used until 1969 for its original purpose as a school and was the purchased by the Town of Markham for use as a museum. The Museum opened in 1971. This large two story schoolhouse is based on an irregular plan 3 bays x 3 bays. Built in 1907 the red brick structure is Edwardian in style with a medium pitch hip roof having a prominent tower at the front north side. The 1 over 1 windows are rectangular and have stone lug sills and lintels. The original front entrance was offset right and set back from where it is today. A small one story addition was added to the front of the building sometime in the early 1980�s which has lowered the entranceway to ground level. In 1976 a two story addition was added to the north elevation to allow for office space and washroom facilities for museum use.